With the first growth of mobile internet, the iOS and Android devices are increasingly gaining more powerful features which increase their efficiency. However, we must not forget that there are serious threats to what has been achieved over a couple of years. This threat comes in the form of viruses which are known to cause very serious security issues. A virus is basically a malicious program which infects and corrupts your phone’s programs and files hence reducing its performance. Most Android viruses come from installed applications which are downloaded from unsecure websites. However, you now have a variety of Antivirus that you can use to check whether an application is full of malware. Examples of Antivirus for use in your Android device include AVG Antivirus, Avast Antivirus, Virus Remover and Norton Antivirus. All you have to do is download the most suitable antivirus from Google Play Store and you are good to go. Once you have downloaded an Antivirus, you will have to open it and tap on “Scan” to initiate the scanning. Wait for the antivirus to perform the scanning before you can finally click on “Resolve” to fix the problem at hand. It is highly recommended that you uninstall the infected app in order to avoid any future issues. Press and hold the power button of your phone until you can see the power off option. Now tap and hold the power off button until ‘Reboot into safe mode” option is displayed on your screen. Open the settings of your Android device and select ‘Apps’. You will now be able to see all the applications which are infected with malware and viruses. Select the app and then click on “Uninstall” to completely remove it from your Android device. You can also decide to perform a factory reset which will erase everything in your Android device and restore the manufacture’s settings. Before you can carry out a factory reset, it is advisable that you backup important data such photos. This will ensure that you still have your important files even after erasing everything in your phone. Next tap on “Factory Data Reset” option. Once you are done, all the installed application together with malware will be removed from your Android device. Removing a virus from an iOS phone is quite simple compared to when doing it for an Android device. This is because the malware or virus cannot easily break the iOS. There is no need to be worried if your iPhone has been infected with a virus since you can easily remove it by using any of the methods below. 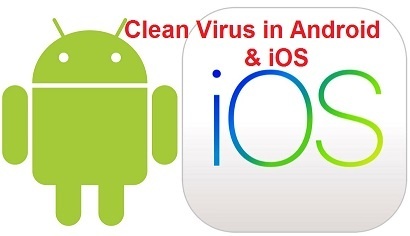 Restarting your iPhone is one of the methods that you can use to clean virus from your iOS device. This is a very simple undertaking since you only have to hold down the power button and wait for “Slide to power off” option to be displayed. Slide the option to turn it off. To restart the iPhone, all you have to do is hold down the power button and wait for a few seconds before it can finally restart. Once this is done, your iOS phone will be virus free. If you have tried all the other options without getting any positive results, you can as well restore your iPhone from an earlier backup. This method will mostly work for those people who are fond of backing up the data and settings from time to time. If the last backup has some malware, you can still search for one that is malware free. You should always protect your Android or iOS phone every time you are using it in order to reduce the risk of infecting it with a virus. Android users can also install an antivirus which will detect any threat in an application before it can be installed. You are also advised to stop downloading applications from unreliable websites and stick to Google Play Store which has secure apps. By doing all this, you will be able to use your Android or iOS device without having to worry about any threats which may slow down your device.